This 1920's era movie palace has a forecourt of famous hand and footprints. Guided tours available inside for a fee. Hint. 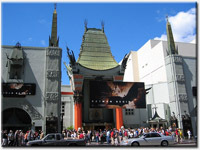 You can see inside the Grauman's Chinese Theatre if buy a movie ticket or just buy $5 walk in ticket.